Nineteenth century baseball players are often overlooked by the fans, but historians of the game appreciate their contribution to the National Pastime in an era that served as the building block of the game we adore today. One of these pioneers does not invoke a familiar ring. The career of Jesse Burkett falls short of the notoriety of the household names of Cy Young, Connie Mack and Cap Anson. Fortunately, for his legacy's sake, the National Baseball Hall of Fame will preserve the feats of such individuals who have indelibly forged their marks in the record books. Jesse Cail Burkett was born on December 4, 1868 (or February 12, 1870 -- Burkett himself was never really sure) in Wheeling, West Virginia. Much of his youth was spent fishing and swimming in the Ohio River. Burkett started his professional career with the Central League's Scranton Miners as a pitcher in 1888. After winning 27 games his first year, he joined the Worcester club of the Atlantic Association where he posted a walloping 39-6 record. The Massachusetts city was so appealing that he purchased a small house and settled there for the remainder of his life. The Indianapolis team of the National League owned his contract but went bankrupt before Burkett was scheduled to appear in uniform. The new Players' League depleted much of the New York Giants talent, so they were desperate to sign the promising lefthander to a contract. After a disappointing 3-10 rookie season with a 5.56 ERA, the Giants sold him to Cleveland, somehow failing to notice his .309 batting average while platooning ninety games in the outfield. Their decision to demote the 5' 8" 155 lb. speedster was most likely predicated on this poor fielding average of .824. The Cleveland Spiders acquired his contract in 1891 and after spending half of the year with the Western Association's Lincoln Rustlers, he returned to the majors and was used exclusively in the outfield for forty games. After two mediocre seasons at the plate and atrocious fielding in left, the fiery competitor exploded with line drives and exceptional bunting abilities as a leadoff hitter. Squaring off was more of an art form in those days, especially because a player was permitted to foul off pitches by bunting and not get called on the third strike as the rule applies today. He credited his success at the plate by possessing "that old con-fee-dence," as he would pronounce it. It was while playing with Cleveland when he earned his nickname "The Crab," based on his testy disposition on the field. Burkett was constantly complaining in addition to insulting opponents, teammates, and antagonizing bleacher fans. Jesse was especially sensitive to suggestions that he resembled Jack Glasscock and was prepared to fight anyone that referred to him as Jack's son. In 1896, he was thrown out of both games of a double header and was escorted from the park by six Louisville policemen. The venom-tongued competitor had punched Washington manager Tom Loftus in the nose after an exchange of vile language during the game and was later fined $50 by the league and an additional $200 by the local court for the incident. His Cleveland team was infamous for playing hard-nosed baseball which included spiking opponents, baiting umpires, beaning batters and circumventing the rules. He once reminisced about his old team, "We were just as tough and mean as the old Orioles, at times even meaner." Towards the end of his career, he deplored any mention referencing his advancing age or diminished speed. His serious demeanor and surly "gameface" did not necessarily transcend beyond the playing field. He displayed patience with young fans and was noted as being a perfect gentleman, spurning smoking, chewing tobacco or drinking. Jesse however enjoyed a passion for vanilla ice cream. Jesse, along with many of the star Spider players, was shifted to the St. Louis franchise in 1899 by owner Frank Robinson, who controlled both clubs. Despite his error-prone fielding, Burkett was a perennial .300-plus hitter who had three .400 seasons. This statistic is only matched by immortals Ty Cobb and Rogers Hornsby. He compiled 2873 hits in 16 seasons for a lifetime batting average of .338. He starred for the Cardinals by winning his third batting title in 1901, until moving to the cross-town Browns the following year, where his numbers began to fade. In 1905, the thirty-seven year-old was traded to the Boston Red Sox for outfielder George Stone. Content that he would be closer to home and his wife, he finished his major league career there, just 127 hits shy of 3000. The following year, he was able to purchase, with money carefully saved, the Worcester club of the New England League where he also managed, played and led the team (batting .300 or better) to four consecutive pennants (1906-09). He remained there until 1913, playing regularly until the age of 45. In 1916, he split the season managing and playing for three minor league squads: Lawrence (Eastern League), Hartford and Lowell. From 1917 to 1920 he coached at his adopted hometown's Holy Cross College. John McGraw made him a coach of the Giants in 1921 for whom he also scouted. After the Fall Classic, the players refused to vote the bitter-tongued "Crab" a World Series share and McGraw had to pull Burkett's bonus money out of his own pocket. McGraw assigned him to be eccentric pitcher "Shufflin' Phil" Douglas's "keeper" but Jesse gave up the job when the wild youngster escaped him during the 1922 campaign. 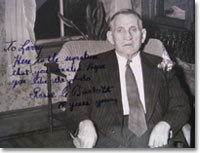 Jesse returned to Worcester to coach for the next two seasons and continued to scout for the Giants into the 1940s. He also had brief managerial stints at Lewiston (of the New England and Northeastern Leagues) in 1928 and 1929 and back in Lowell of the Eastern League in 1933. Retiring to Worcester, at 457 Grove Street, Jesse would host old baseball friends en route to Boston and was one of the few active remnants of the nineteenth century game. On occasion he would drive into Boston and attend Braves games unnoticed. His wife, the former Ellen G. McGrath, preceded him in death in 1950. For several years, he was confined to his bed suffering from hardening of the arteries. On June 13, 1946 he was inducted (#39) in to the Hall of Fame by The Committee on Baseball Veterans after receiving little support in years prior from the BBWAA. His comment upon selection follows, "It took them a long time, and I thought they weren't going to because everybody had forgotten me." No records show any attendance in Cooperstown that year or subsequent enshrinements for Burkett. He died as a result to his progressive ailment on May 27, 1953, at Belmont Hospital at the age of 84. He was interred along with his wife at St. John's Cemetery, also in Worcester. Typically, he would sign his name "Jesse Burkett" or even at times insert his middle initial "C". A more slanted, free flowing style succumbed to a smaller, more upright, labored scrawl in later years. His capital "J" is an example if a unique characteristic unlike a conventional "J" that uses a single unbroken pretzel-like formation. At times, it may appear to resemble a conjoined "C" and printed descended "S". The non-descript "e" may be attached at times but it depends on the version of the "J" used, and the subsequent connector stroke forms two identical, open bottom "s"'s that finishes with another similar "e". His "old world" "C" is reminiscent of the ones used by Connie Mack, Waite Hoyt or Grover Cleveland Alexander. Now a carefully constructed capital "B" containing a single loop and two eyelets may or may not lead into the "u" and more pronounced "r". A double open-loop "k" stretches at least as high as the "B" followed by a diminutive close-looped "e" and double "t" with a heavily-slanted single cross stroke. Later examples are certainly more difficult to authenticate due to poor flow and the lack of speed once exhibited in his younger signature. From Jesse Burkett's Major League playing career (1890-1905), I'm sure there are less than a handful of signatures that exist today. Fans from that era were disinterested in collecting and what little was generated a hundred or more years ago is long gone. Correspondence from his 20th century minor league days surfaces infrequently on Worcester Base Ball Company letterhead. I caution that several of these from this period (circa 1912) are secretarially handwritten. The easiest way to identify this translation is the ghost writer would omit the final "e" in the first name Jesse. 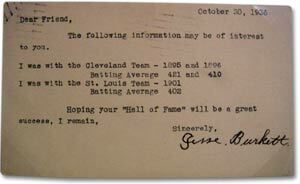 Valid typewritten versions ($3000) or handwritten specimens ($4000) are almost assured to have baseball content. There were actually two single signed baseballs that were consigned from family members in a December, 2002 Mastronet auction. These were signed on the side panel and Burkett highlighted the three years (1895, 1896 and 1901) that he hit over .400. A few years back, the same auction house sold an 8"x10" black and white photograph inscribed with the passage "78 years young." I recall only examining two index cards ($2000) with the same notations printed. A government postcard ($2500) would be a treasure. The only baseball card I can ever imagine being signed is the 1950-56 Callahan HOF set (W576). These undersized signed cards ($2500) are rarely offered. Only one lucky collector covets the sole front-signed check (name your price) drawn on The New York (Giants) Base Ball Club. Burkett actually signed this anomaly after the signature of Harry J. Boyle was scratched out. Occasionally, a signed Albertype (Artvue is impossible) plaque postcard ($2800 and increasing in value) is pried out of someone's collection but beware of forgeries. This would be a prime target of the counterfeit hand. Signed bats, gloves and other exotic forms of signed memorabilia should be dismissed having but an astronomical chance of being valid.